With conference action now in full swing across the country, the excitement and the stakes are at an all-time high for the year. As a result, three Top 10 teams kissed their perfect seasons goodbye over the weekend, while only No. 14 Washington State and unranked Boston College remain perfect. Here’s a recap of some of the biggest games and biggest upsets of the weekend—and the season thus far. The second-ranked Texas A&M Aggies suffered their first loss of the season, falling 3-2 on the road against unranked Arkansas on Thursday night. Arkansas’s Stefanie Doyle connected with Tori Cannata to put the Razorbacks on the board first in the 14th minute, but the Aggies answered two minutes later through Kendall Ritchie to level the score, where it remained through the break. 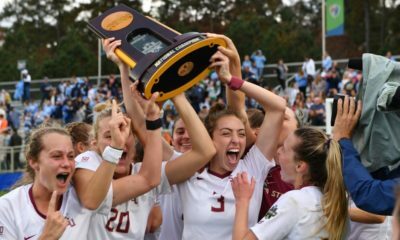 Cannata then completed her brace in the 62nd minute, capitalizing off the Aggie defense’s inability to clear the ball in front of goal, to put the home team back in the lead. Doyle tallied her second assist of the night less than 10 minutes later, sending in a cross from the right side for Bryana Hunter, who chipped the ball in from four yards out. The Aggies were able to get one back via Asdis Halldorsdottir in the 84th minute but fell short of the equalizer for their first defeat of the year. The Aggies bounced back from the loss on Sunday though, defeating Georgia 2-0 back home at Ellis Field. The No. 4 Virginia Cavaliers engaged in a defensive battle with the unranked Clemson Tigers on Thursday night that saw the game remain scoreless until the 105th minute, when Clemson sophomore forward Mariana Speckmaier got her head on a corner kick sent in by senior Sam Staab and sent it into the back of the net for the golden goal. The Cavaliers outshot Clemson 17-10 (4-4) in the match, but failed to capitalize on any of the opportunities created. That included a missed penalty shot in the first half, which registered as the only shot on goal in the opening 45 minutes for Virginia. The loss marks the first time this season Virginia has been unable to score in a game. Like Texas A&M, Virginia also returned to their winning ways, defeating Duke 2-0 in our NCAA Game of the Week. The No. 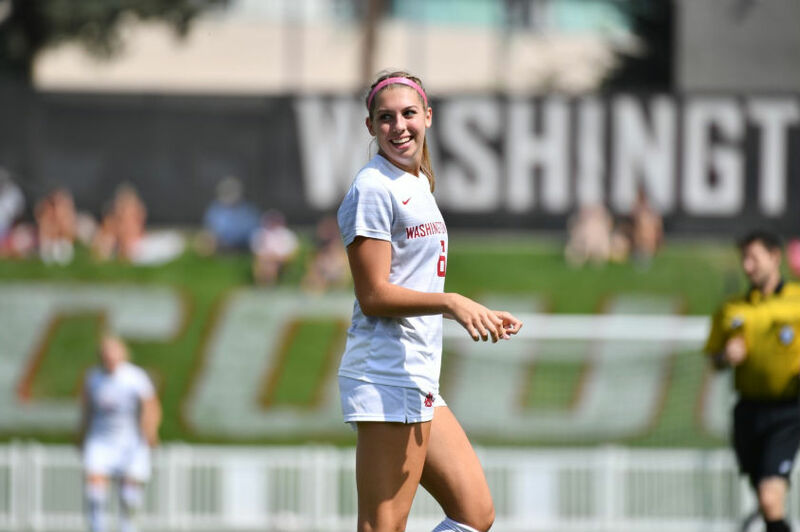 14 Washington State Cougars upset the eighth-ranked UCLA Bruins, 1-0, in Los Angeles on Friday night. The win was the second straight upset for the Cougs over UCLA, as last season Washington State handed the then second-ranked Bruins their first loss of 2017. Although not as dramatic as last year’s win, the result keeps Washington State as the only ranked team to remain perfect on the year. The lone goal of the match came in the 61st minute after sophomore defender Aaqila McLyn squashed the Bruins attack before countering with a long ball over the top for junior Morgan Weaver, who was streaking towards the far post. Weaver then cut around and through the Bruins defense before putting a low shot past UCLA keeper Lauren Brzykcy. The ninth-ranked Auburn Tigers entered the weekend on nine straight wins, their best start in program history. However, their perfect start was snapped Thursday night with a scoreless draw against LSU, and their undefeated streak was snapped with a 3-2 home loss to Ole Miss on Sunday. Ole Miss senior CeCe Kizer, who finished third in the nation last year in goals and points, scored two unassisted goals in the match to increase her goal total to 11 on the year. Her second goal was not only the game winner, but it also broke the Ole Miss records for career goals and career points. 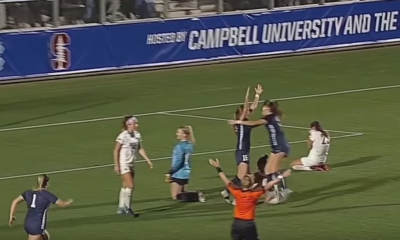 After over a half hour of scoreless back-and-forth between the two SEC sides, Auburn finally broke the deadlock through junior attacker Jessie Gerow, only to see Channing Foster answer for Ole Miss moments later. Kizer then put the visitors on top less than a minute into the second half, making a run from midfield before firing a shot past Auburn redshirt senior goalkeeper Sarah Le Beau. 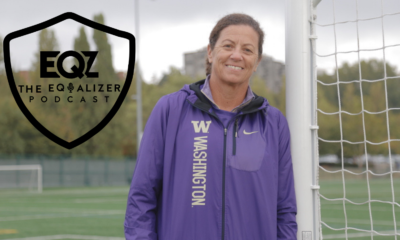 Auburn brought the score back level in the 57th minute through a Bri Folds penalty, but their tired defense was unable to stop Kizer’s blistering run in the 78th minute. Kizer, who had just re-entered the match after a 10-minute rest on the bench, put her fresh legs to work, blazing a trail through the Auburn defense before putting away the game winner. After a scoreless first half, the Boston College Golden Eagles edged out the No. 7 Florida State Seminoles, 2-1, at home on Sunday afternoon. The two teams exchanged a pair of penalties in the second half, with Gaby Carreiro first converting for the Golden Eagles to open up scoring on the day before Deyna Castellanos brought the game back level from the spot in the 73rd minute. Boston College immediately answered Castellanos’ penalty by putting away the game winner less than a minute later. 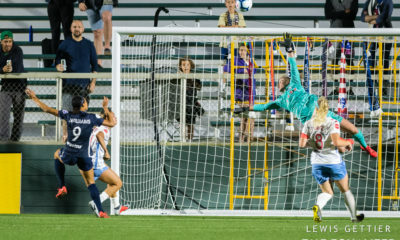 Junior Jenna Bike, who earned the penalty earlier in the half, got on the end of the perfectly-weighted through ball from Emily Langenderfer and put the ball past FSU goalkeeper Brooke Bollinger, who was coming off her line in attempts of cutting off Bike’s angle, for the game-winning goal. With the result, the Golden Eagles are now the only currently unranked team to remain perfect on the season. 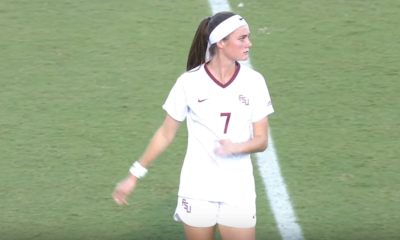 – In addition to her penalty in Florida State’s loss to Boston College, Deyna Castellanos also scored two goals in the Seminole’s 3-0 shutout over Virginia Tech on Friday, including this beauty in the 65th minute. – Speaking of goals, it only took senior Sh’Nia Gordon 25 seconds to score the game-winning goal in West Virginia’s 2-0 win over No. 21 TCU on Sunday. The goal is the fastest goal in WVU history. – Sophomore attacker Frankie Tagliaferri scored a brace to give Penn State the come-from-behind overtime win on the road against Illinois on Saturday. The match marks the first time the Nittany Lions have seen a match go into overtime this year. 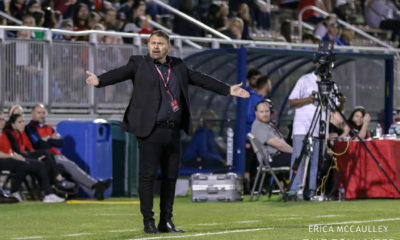 – SMU’s head coach Chris Petrucelli earned his 400th career win with the Mustangs’ 4-1 win over UConn on Sunday. – Monmouth’s Krissy Turner also achieved a coaching milestone this weekend, notching her 250th career win with the Hawks’ dominant 9-0 win over St. Peter’s on Saturday.